Rising temperatures are melting frozen soil at an alarming clip with the changes visible before our very eyes today. But the future promises an even more dramatic shift according to a new study published Tuesday in Nature Communications. As the frozen ground turns to muck, it could result in millions of people left without homes or the infrastructure that makes living in one of the harshest environments on Earth possible. What’s more disconcerting is that even if the world slashes carbon emissions dramatically, these changes are basically locked. The new findings offer what the authors call “an unprecedentedly high spatial resolution” look at how the melt of frozen soil, known as permafrost, will impact infrastructure. As permafrost melts, it essentially turns previously firm ground into a slurry of soil and water. Communities in the Arctic are already coping with the impacts the 1 degree Celsius of warming since the industrial revolution has wrought. Infrastructure is collapsing or at risk of it as are traditional ways of life. 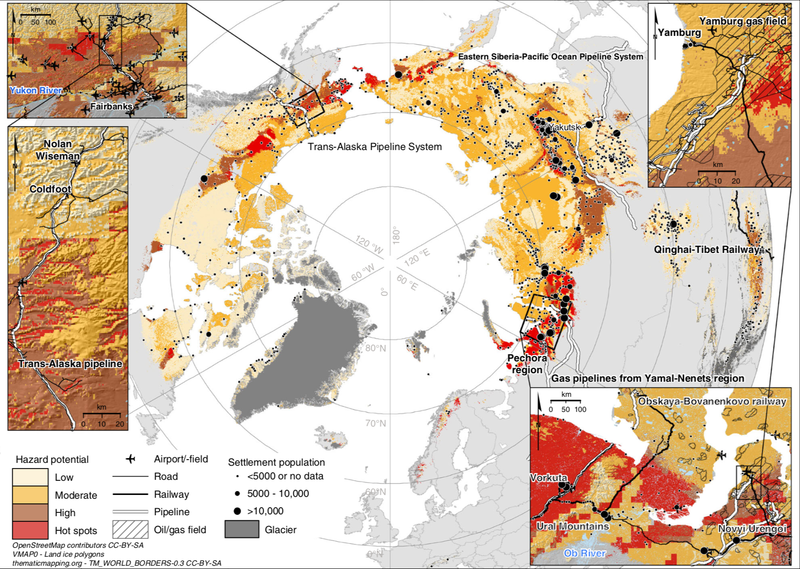 To see what the future holds for the permafrost region, the authors overlaid data of where permafrost deposits exist in the Arctic with infrastructure and settlements. They then looked a variety of climate scenarios to see how much the surface layer of permafrost is likely to melt by mid-century, all at a resolution on 1 kilometre. The findings show that a whopping 70 per cent of infrastructure in the permafrost region—the equivalent of one-third of all Arctic infrastructure—sits on land that has a high potential for permafrost thaw by mid-century. That includes railroads, homes, and ironically oil and gas infrastructure that’s responsible for shipping carbon-emitting fossil fuels to market. Nearly 4 million people call the high-risk regions home. If the infrastructure isn’t adapted to the melting landscape, it could force these people to migrate to areas with more solid ground.